ChargeIt by Jay Platinum Rim Clear Glass Charger Plate 13"
Home > Products > ChargeIt by Jay Platinum Rim Clear Glass Charger Plate 13"
This item will be back in stock May 31st. Order now to reserve. Give your table setting an upscale makeover with the ChargeIt by Jay Platinum Rim Clear Glass Charger Plate 13". 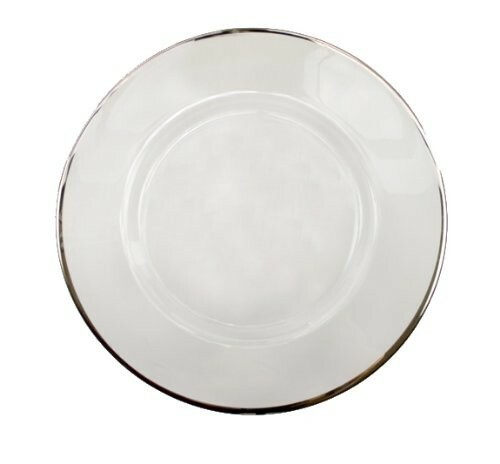 Featuring a platinum rim, this product provides a subtle shine and sparkle, complementing any dinnerware collection. Thanks to its ample 13" diameter surface, this charger beautifully frames standard size dinner plates while protecting your tabletop from spills and mess. Made from high quality glass, it boasts superior craftsmanship for years of use making it ideal for weddings and formal events. For proper cleaning and maintenance, this charger plate should be hand washed only.